Artifactory sits at the heart of critical software development processes in any organization that has realized the need for advanced artifact management. Depending on who (or which CI server) a particular instance of Artifactory serves, a disaster hitting that instance may cause anything from preventing a group of developers from doing their daily tasks to completely shutting down an organization’s production systems. So whether it’s a flash flood that has drowned your servers, an electrical malfunction that frazzled them, or a disgruntled employee who has demolished them, you want to be able to recover from these and any other type of disaster that puts your servers out of commission. On a calmer note, you might also want a quick and easy way to continue providing your developers and production systems with uninterrupted service when you need to take a server down for maintenance. Matching up local repositories on your Master instance with corresponding repositories on the Target. And then, once the disaster has passed, you need to do everything again, in reverse, to get your new Master instance up-to-date and back in action. This is where JFrog Mission Control is your super-hero. In the recently released version 1.3, Mission Control makes it easy for you to prepare for any disaster. Configure → Init → Synchronize, so that if disaster hits, all you need to do is Activate DR and reconfigure your load balancer to reroute requests to Artifactory on your newly activated DR Target. Now, we know that synchronizing repositories can strain your network resources, so Mission Control won’t invoke replication of all your repositories at once, but rather staggers the onset of replication with a configurable time interval. And for those of you who prefer to manage synchronizing your repositories manually, Mission Control gives you the option of moving the data yourself. Whether a disaster hits, or you’re just replacing some old hardware, there’s no need to interrupt Artifactory service to any of your users or systems. 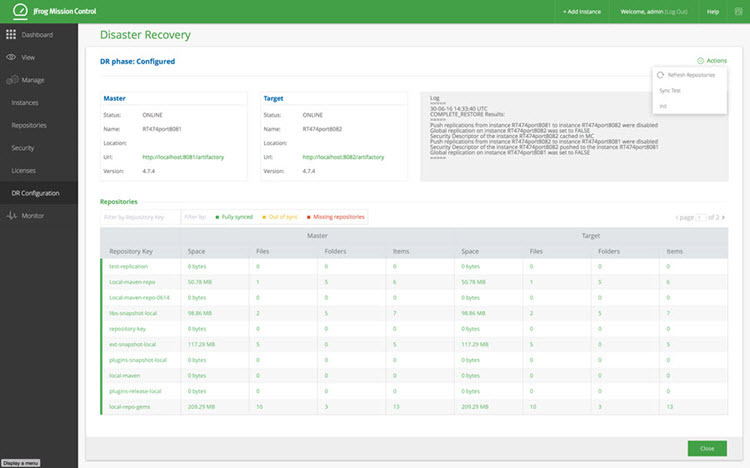 With Mission Control’s new Disaster Recovery, it’s easy to set up DR, invoke it, and then restore operations to your new Master instance once the “disaster” has been remediated without your users ever knowing anything happened.